The autonomic nervous system (ANS) plays an important role, not only in physiological situations, but also in various pathological settings such as diabetic neuropathy, myocardial infarction (MI) and congestive heart failure (CHF). Autonomic imbalance associating increased sympathetic activity and reduced vagal tone has been strongly implicated in the pathophysiology of arrhythmogenesis and sudden cardiac death. The standard measurements intervening in the analysis of HRV comprise time domain indices, geometric methods and components of the frequency domain. The use of long or short-term recordings depends on the type of study that has to be realised. Established clinical data based on numerous studies published during the last decade consider decreased global HRV as a strong predictor of increased all-cause cardiac and/or arrhythmic mortality, particularly in patients at risk after MI or with CHF. This article reviews the mechanism, the parameters and the use of HRV as a marker reflecting the activity of the sympathetic and vagal components of the ANS on the sinus node, and as a clinical tool for screening and identifying patients particularly at risk for cardiac mortality. In the course of the last two decades numerous studies with both animals and human beings have shown a significant relationship between the ANS and cardiovascular mortality, particularly in patients with MI and CHF. Perturbations of the ANS and its imbalance consisting of either increased sympathetic or reduced vagal activity may result in ventricular tachyarrhythmias and sudden cardiac death, which is nowadays one of the leading causes of cardiovascular mortality. There are presently various methods available for assessing the status of the ANS, which include cardiovascular reflex tests, and biochemical and scintigraphic tests. Techniques giving direct access to receptors at the cellular level or to neural traffic are not routinely available. In recent years noninvasive techniques based on the electrocardiogram (ECG) have been used as markers of autonomic modulation of the heart, these include HRV, baroreflex sensitivity (BRS), QT interval, and heart rate turbulence (HRT), a new method based on fluctuations of sinus rhythm cycle length after a single premature ventricular contraction. Among these techniques analysis of HRV has emerged as a simple, noninvasive method to evaluate the sympatho-vagal balance at the sinoatrial level. Although automaticity is intrinsic to different cardiac tissues with pacemaker properties, the electrical and contractile activity of the myocardium is largely modulated by the ANS. This neural regulation is effected through the interplay of the sympathetic and vagal outflows. In most physiological conditions the efferent sympathetic and parasympathetic branches have opposing actions: the sympathetic system enhances automaticity, whereas the parasympathetic system inhibits it. While the effect of vagal stimulation on the cardiac pacemaker cells is to cause hyperpolarisation and to reduce the rate of depolarisation, sympathetic stimulation causes chronotropic effects by increasing the rate of pacemaker depolarisation. Both branches of the ANS influence ion channel activity implicated in the regulation of depolarisation of the cardiac pacemaker cells. Abnormalities of the ANS have been demonstrated in diverse conditions such as diabetic neuropathy and coronary heart disease, particularly in the context of MI. A dysregulation in the autonomic nervous control of the cardiovascular system associating increased sympathetic and reduced parasympathetic tone plays an important role in coronary artery disease and in the genesis of life-threatening ventricular arrhythmias. The occurrence of ischemia and/or myocardial necrosis may induce a mechanical distortion of the afferent and efferent fibers of the ANS due to changes in the geometry related to necrotic and noncontracting segments of the heart. A newly recognised phenomenon is the electrical remodeling due to local nerve growth and degeneration at the level of the myocardial cell in the setting of ischemia and/or myocardial necrosis. Taken as a whole, in patients with coronary artery disease and a history of MI, cardiac autonomic function associating increased sympathetic and decreased vagal tone are conditions favourable to the complex phenomenon of life threatening arrhythmias because they modulate cardiac automaticity, conduction and importantly haemodynamic variables. Heart rate variability is a noninvasive electrocardiographic marker reflecting the activity of the sympathetic and vagal components of the ANS on the sinus node of the heart. It expresses the total amount of variations of both instantaneous HR and RR intervals (intervals between QRS complexes of normal sinus depolarisations). Thus, HRV analyses the tonic baseline autonomic function. In a normal heart with an integer ANS, there will be continuous physiological variations of the sinus cycles reflecting a balanced sympthovagal state and normal HRV. In a damaged heart that has suffered from myocardial necrosis, the changes in activity in the afferent and efferent fibers of the ANS and in the local neural regulation will contribute to the resulting sympathovagal imbalance, reflected by a diminished HRV. Analysis of HRV consists of a series of measurements of successive RR interval variations of sinus origin which provide information about autonomic tone. Different physiological factors may influence HRV, such as gender, age, circadian rhythm, respiration and body position. Measurements of HRV are noninvasive and highly reproducible. Most Holter apparatus manufacturers nowadays recommend HRV analysis programs which are incorporated into their instrument systems. Although computer analysis of tape recordings has improved, human intervention is required in most measurements of HRV parameters in order to detect erroneous beats, artifacts, and alterations in tape speed that may alter timing intervals. 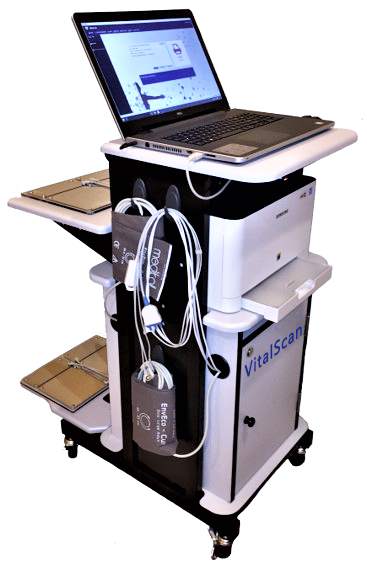 In 1996 a Task Force of the European Society of Cardiology (ESC) and the North American Society of Pacing and Electrophysiology (NASPE) defined and established standards of measurement, physiological interpretation and clinical use of HRV. Time domain indices, geometric measures and frequency domain indices nowadays constitute the standard clinically used parameters. Time domain analysis measures the changes in heart rate over time or the intervals between successive normal cardiac cycles. In a continuous ECG recording, each QRS complex is detected and the normal RR intervals (NN intervals), due to sinus depolarisations, or the instantaneous heart rate, are then determined. The calculated time domain variables may be simple, such as the mean RR interval, the mean heart rate, the difference between the longest and shortest RR interval, or the difference between night and day heart rate; and more complex based on statistical measurements. These statistical time domain indices are divided in two categories, including beat-to-beat intervals or variables derived directly from the intervals themselves or the instantaneous HR and intervals derived from the differences between adjacent NN intervals. The table below summarizes the most frequently used parameters of the time domain. Parameters of the first category are SDNN, SDANN and SD and those of the second category are RMSSD and pNN50. SDNN is a global index of HRV and reflects all long-term components and circadian rhythms responsible for variability in the recording period. SDANN is an index of the variability of the average of 5-minute. Thus, it provides long-term information. It is a sensitive index of low frequencies like physical activity, changes in position, circadian rhythm. SD is generally considered to reflect the day/night changes of HRV. RMSSD and pNN50 are the most common parameters based on interval differences. These measurements correspond to short-term HRV changes and are not dependent on day/night variations. They reflect alterations in autonomic tone that are predominantly vagally mediated. Compared to pNN50, RMSSD seems to be more stable and should be preferred for clinical use. Geometric methods are derived and constructed from the conversion of sequences of NN intervals. There are different geometrical forms for assessing HRV: the histogram, the HRV triangular index and its modification, the triangular interpolation of NN interval histogram, and the method based on Lorentz or Poincar� plots. The histogram assesses the relationship between the total number of RR intervals detected and the RR interval variation. The triangular HRV index considers the major peak of the histogram as a triangle with its baseline width corresponding to the amount of RR interval variability, its height corresponds to the most frequently observed duration of RR intervals, and its area corresponds to the total number of all RR intervals used to construct it. The triangular HRV index is an estimate of the overall HRV. Geometrical methods are less affected by the quality of the recorded data and may provide an alternative to less easily obtainable statistical parameters. However, the time duration of recording should be at least 20 minutes, which means that short-term recordings cannot be assessed by geometric methods. From all variety of time domain and geometric methods available, the Task Force of the ESC and the NASPE has recommended the use of four measures for HRV assessment: SDNN, SDANN, RMSSD and the HRV triangular index. Frequency domain (power spectral density) analysis describes the periodic oscillations of the heart rate signal decomposed at different frequencies and amplitudes; and provides information on the amount of their relative intensity (termed variance or power) in the heart's sinus rhythm. Schematically, spectral analysis may be compared to the results obtained when white light passes through a prism, resulting in different lights of different colour and wave length. Power spectral analysis can be performed in two ways: 1) by a nonparametric method, the fast Fourier transformation (FFT), which is characterized by discrete peaks for the several frequency components, and 2) by a parametric method, the autoregressive model estimation, resulting in a continuous smooth spectrum of activity. While the FFT is a simple and rapid method, the parametric method is more complex and needs verification of the suitability of the chosen model. When using the FFT the individual RR intervals stored in the computer are transformed into bands with different spectral frequencies. This process is similar to decomposing the sound of a symphony orchestra into the underlying notes. The results obtained can be transformed in Hertz (Hz) by dividing by the mean RR interval length. The power spectrum consists of frequency bands ranging from 0 to 0.5 Hz and can be classified into four bands: the ultra low frequency band (ULF), the very low frequency band (VLF), the low frequency band (LF) and the high frequency band (HF). The total power of RR interval variability is the total variance and corresponds to the sum of the four spectral bands, LF, HF, ULF and VLF. The HF component is generally defined as a marker of vagal modulation. This component is respiration-mediated and thus determined by the frequency of breathing. The LF component is modulated by both the sympathetic and parasympathetic nervous systems. In this sense, its interpretation is more controversial. Some scientists consider LF power, particularly when expressed in normalised units, as a measure of sympathetic modulations; others interpret it as a combination of sympathetic and parasympathetic activity. The consensus is that it reflects a mixture of both autonomic inputs. In practical terms, an increase of the LF component (tilt, mental and/or physical stress, sympathomimetic pharmacologic agents) has been generally considered to be a consequence of sympathetic activity. Conversely, b-adrenergic blockade resulted in reduction of the LF power. However, in some conditions associated with sympathetic overexcitation, for example in patients with advanced CHF, the LF component was found to be drastically diminished, reflecting thereby the decreased responsiveness of the sinus node to neural inputs. The LF/HF ratio reflects the global sympatho-vagal balance and can be used as a measure of this balance. With an average normal adult in resting conditions, the ratio is generally between 1 and 2. ULF and VLF are spectral components with very low oscillations. The ULF component might reflect circadian and neuroendocrine rhythms and the VLF component long period rhythms. The VLF component has been found to be a major determinant of physical activity and was proposed as a marker of sympathetic activity. There are established correlations between time domain and frequency domain parameters: pNN50 and RMSSD correlate with themselves and with HF power (r = 0.96), SDNN and SDANN indices correlate significantly with total power and the ULF component. Normal reference values and values in patients with a MI for standard measures of heart rate variability. Because HRV deals with RR interval variations its measurement is limited to patients in sinus rhythm and to those with a low number of ectopic beats. In this sense, approximately 20 to 30% of high risk post-MI patients are excluded from any HRV analysis due to frequent ectopy or episodes of atrial arrhythmias, particularly atrial fibrillation. The latter one may be observed in up to 15 to 30% of patients with CHF, excluding those from any HRV analysis. Nonlinear methods are based on the chaos theory and fractal geometry. Chaos has been defined as the study of multivariable, nonlinear and nonperiodic systems. Chaos describes natural systems in a different way because it can account for nature's randomness and nonperiodicity. Perhaps the theory of chaos may help in better understanding HR dynamics, taking into account that the healthy heartbeat is slightly irregular and to some extent chaotic. In the near future nonlinear fractal methods may give new insights into HR dynamics in the context of physiological changes and in high risk situations, particularly in patients after MI or in the context of sudden death. Recent data suggest that fractal analysis in comparison to standard HRV measurements seems to detect abnormal patterns of RR fluctuations more efficiently.